Well it looks like the rumors we reported were true, Coachella has announced a cruise ship festival named S.S. Coachella. Much like their landlocked festival in Indio, California this cruise festival will take place on two separate dates. Each trip departs from Fort Lauderdale, Flordia with the first festival at sea will heading to the Bahamas on December 16-19 and the second to Jamaica December 19-23rd. 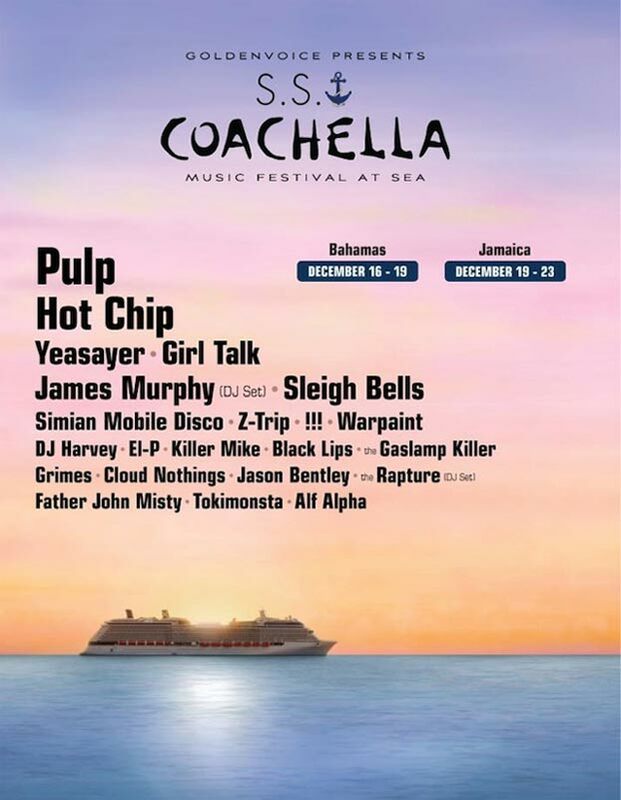 The headliners for these cruises are; Pulp, Hot Chip, Yeasayer and Girl Talk. Some of the other bands that will perform are James Murphy of LCD Soundsystem (who will host a wine tasting), Z-Trip, Sleigh Bells, Grimes, Cloud Nothings, Simian Mobile Disco, !!! and more. The cheapest ticket will be $500 per person (providing you have 4 guests) for an inside Stateroom which including the cabin, food and of course, the entertainment. Let the countdown begin, the first S.S. Coachella takes off 152 days from now.